I’ve been lucky enough to pick up a couple of extra pieces of gear over the last two weeks, so thought I might have another look at whether I should aim for the next major haste breakpoint for druids, ie: 2005. I’m at work, so I’m going for the quick-and-dirty option of CharDev. Importing Glowberry in her current state, and I have a haste rating of 1108. I’ve been focussing on mastery, as until recently my gearing wasn’t high enough to hit the 2005 mark without reforging/regemming everything to haste. I was actually much closer to the lower breakpoint, but picked up Passive Resistor Spaulders recently, and haven’t forged off the haste to mastery yet. This is with a reforging strat of all haste/crit to mastery until lower break point, anything else I can’t reforge into mastery, reforge to spirit, and gemming prioritising int/mastery. Yay! I made it. I actually didn’t have to go silly with gemming to reach this. I still met +20 socket bonuses, and just replaced yellows/prismatic with Quick, reds with Reckless, and any crappy socket bonuses with Quick. No enchanting changes. Okay so. What if I abandon the spirit part of my reforging plan? 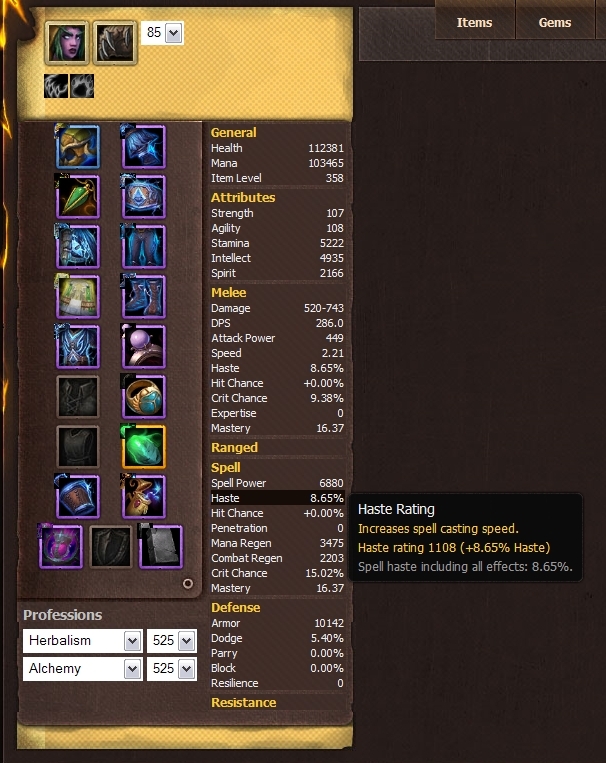 What if I still reforge crit/mastery to haste where possible, but only reforge crit to mastery on items with haste, and leave the spirit alone? Okay so I can keep roughly the same Spririt level but lose out on Mastery as expected. I can easily reach the haste 2005 break point without mindlessly replacing every gem and reforge with straight haste, so this is good. I’ll be sacrificing some int, which is to be expected as I have quite a few Brilliants at the moment that would go, in favour of haste/haste blend gems. But the int loss isn’t as bad as I thought it might be. I can get the haste breakpoint while either sacrificing a chunk of spirit or a chunk of mastery (or somewhere in between). I hadn’t considered this before. We’re currently working on Cho’Gall, where mana is definitely an issue for me late in the fight, so if I do reforge/regem for tonight’s raid, it would be with the spirit-heavy strategy. I’m 10 man tank healing, splashing around raid healing as usual. Argh at tank swapping fights and my hideous low LB uptime. Argh at only 8 Swiftmends, what was I *doing*? And 40 Regrowths?! wtf!? ANYWAY, pretending that I was doing a good job here for one moment, the main thing to note is the usual pattern for me: WG and RJ are my highest heals. So on one hand the extra tick from WG would be great, on the other hand I’ll be losing a big chunk of mastery. And based on previous mastery analysis in a similar role, I tend to make pretty high use of my mastery. I’m really not sure, should I wait for 4.1 to drop, and see what the new Efflorescence brings before I do this? Or should I jump right in and see how I go with it on what (for us) is progression content? I’ve been looking at the changes coming in for druid healing in 4.1, and reading/thinking about how they will change how I heal. So time for some crystal ball gazing. Efflorescence has a new spell effect. Efflorescence has been redesigned. It creates a healing zone at the feet of a Swiftmend target, but this healing zone now restores health equal to 4/8/12% of the amount healed by Swiftmend to the three most injured targets within 8 yards, every 1 second for 7 seconds. This periodic effect now also benefits from spell haste, but the individual ticks cannot be critical effects. In addition, Living Seed is no longer a prerequisite talent for Efflorescence. The combination of the ground clutter and the lacklustre performance of the spell are why I dropped the 6 points from this and Living seed a while back. The new spell graphics are a lot more ground-friendly but more importantly, the switch to this being a smart heal give it a lot more appeal. 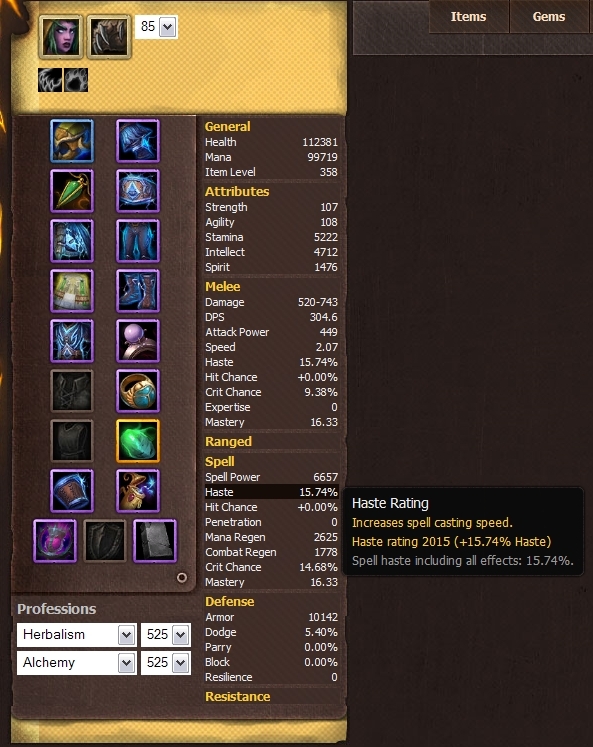 Aaand, I might look again at whether I want to push for more haste, especially when I’m purely raid healing. Hitting the 2005 haste break point would mean an extra tick from WG and from Efflo. I’m in a ten man guild, so I’m still not sure whether I’m better off sitting on my mastery oriented current gearing, but I’m looking forward to experimenting with it and seeing what it brings. Lifebloom’s bloom effect has been reduced by 20%. I tend to only let Lifebloom ‘bloom’ in emergency situations (or during tree) and currently don’t take any more points in GoTEM than I have to, so I doubt I’ll see much difference here. Nature’s Swiftness: When activated, your next Nature spell with a base casting time less than 10 sec. becomes an instant cast spell. If that spell is a healing spell, the amount healed will be increased by 50%. Ok this is starting to look a bit tastier. I loved NS back in vanilla as a tank saver (omg NS rotations on Maexxna 1.0) but it’s slipped further and further into the doldrums with each increase in tank health. This will give it a bit more bang for buck, especially with my current mastery-focussed gearing. Looking forward to trying this out and having ye olde NSHT macro back on my bars. Malfurion’s Gift now reduces the cooldown of Tranquility by 2.5/5 minutes. Well, this is the big much-talked about change in the druid community. Is the change designed to ‘bring it on par’ with power word barrier? Does this mean it’s our ‘new cooldown’? Does this mean we can say goodbye to a ‘proper raid cooldown’ or tank cooldown? Will it just mean other healers point at the healing meters and cry that we’re ‘once again OP’? Doesn’t it just enhance a very ‘undruidy’ spell that requires us to stand still for 8 seconds? These are just nice additions. It will be great having another brez in our (10 man) raid, especially as it means I can be rezzed now sometimes, other than as a ghoul! 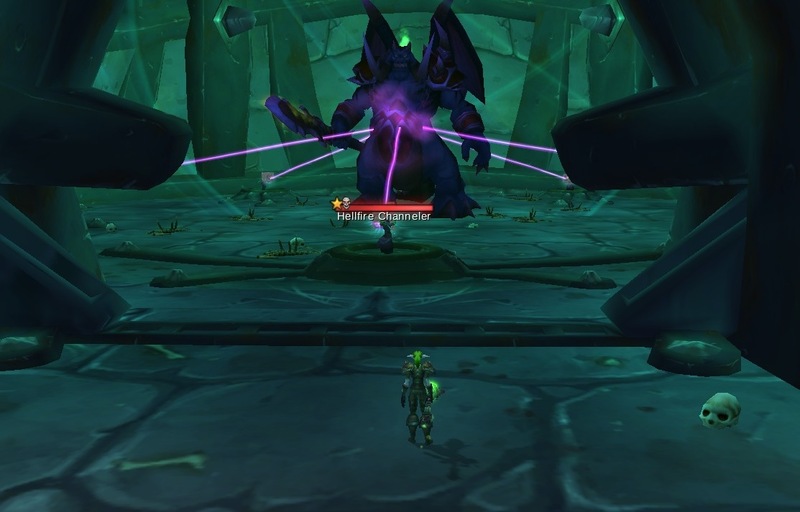 The raid frames is a bit of an ‘oh, FINALLY’ reaction for me – but I’m still wondering whether us night elves will get our corpses back when we release – and whether we’ll be considered to be ‘out of range’ for that reason. We’ll see. I can see that with this and the shaman changes, Blizzard are looking a bit closer at what the we’re bringing to the table apart from our raw healing output. It will be interesting to see how far they go with that – I’d hate to see a healer homogenisation go too far. In the short term I’m looking forward to experimenting with a different spec, and hoping it can help our guild push a bit further in our current endeavours. I haven’t posted for a few days, but I have been busily updating the blog stealthily in the background. Not surprisingly, this is taking me a while. I’ll post the first part soon (hopefully over the weekend) as that’s nearly done; I just need to add some screenshots and flesh out the last section a little. Writing this to be as short and simple as possible is a challenge, especially when I love the class/spec and tend to ramble when I let myself loose. The second section I’m mainly writing for self-indulgent reasons. I know there’s already lots of detailed druid guides out there, but I don’t want my ‘simple’ guide to be seen as all there is, so the need to flesh this out in a second ‘chapter’ compels me. So in summary: watch this space, especially if you have a friend/alt/offspec interested in dipping toes into the pond of resto druid healing for the first time. So I discovered this today while healing a heroic. How did I miss this patch note….? Tank cooldowns for druids inc? Still interested to see what this looks like. Suggetions around the traps have ranged from barkskin as a targetable buff through to Swiftmend giving a Pain-suppression-like mitigation effect, but it would be nice if it was something more creative (but still useful). My rational for this was the extra heals on the LB bloom when I’m a tree, but I’m still not 100% sold on this. 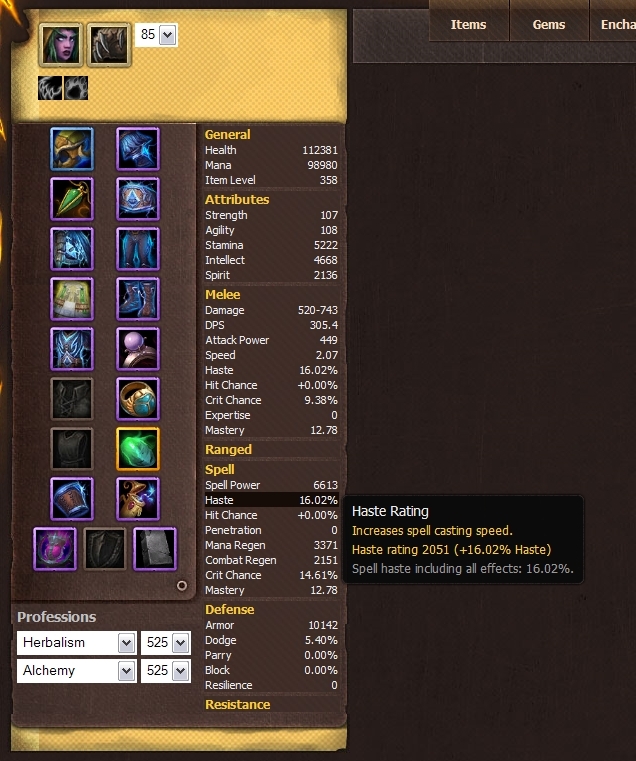 I started comparing my healing profiles from our Chimaeron kills pre and post 4.0.6, but the differences were SO hilarious (just way too hilarious), and I remembered we swapped from having a warrior soak tank to a DK soak tank so things were a little skewed. These are a week apart, my role in each case was to heal the add tank, but of course I’m spraying around HoTs as well. First thing that stands out to me is how much less is going on in the second one. No Living seed and no Effluorescence. Did I notice the difference? No. Well, except that I wasn’t casting any Swiftmends just to put green circles under people, so my Swiftmend numbers were way lower in the second week. Actually how much lower scares me a little. I use swiftmend on frozen targets to rapidly top them up before they are broken out, so it worries me that I only cast three SMs on the kill shot. Perhaps I was just trusting our other (excellent) healers more, and panicking less. Or perhaps I was just less attentive. Something to watch for this week. Third thing I noticed is the huge difference between WG and RJ each week. they’ve swapped places. Wild growth is stronger after 4.0.6, but I didn’t realise how much difference it would make. Also, I actually cast maybe 20% fewer RJs on the second week – maybe this was due to the slightly increased mana cost from the week before, or maybe WG was filling the role of RJ in some cases for me. Again, one to try to be a bit more aware of this week. I spent the extra two points in GotEM, so what am I getting out of that? Lifebloom was about the same across the two weeks, though the bloom was slightly higher the second week (the bloom is the second spell marked as lifebloom in each list). I only pop into tree form in Maloriak during the last 25%, so there won’t be a huge amount of blooming. I DO let LB bloom as an emergency heal if my tank is out of range or I’m on the move and he’s low, so I get an occasion bloom out of treefrom, but it’s rare. I’m getting a small amount of extra from the initial RJ heal as well (again the second spell marked as Rejuvenation in each list) but again, 30k extra over nearly 7 minutes… I’m not completely sold on it. Also, it’s not like I feel it will be saving lives at any stage either; despite being an instant heal it’s still only 1800 a pop. Another standout is that I’m casting Healing Touch a lot less and Regrowth a lot more. That kind of blew my mind. I wondered if it was a change in my tank-heal style, now that regrowth refreshes LB, or whether it was from using it more on the raid (which would be insane!). So I dug out my actual heals on my add tank to see if that’s where the difference was. It seems that although I am using Regrowth more on my tank, I’m also using it a whole lot more generally. This shocked me.I’m not a Regrowth spammer, and never have been… but I’m sliding down the Regrowth chute here without even knowing! I was also concerned as I noticed my effective HPS on my tank had gone DOWN from one week to the next! Well, I was concerned until I dug into the tank’s damage taken and realise that he’d taken less damage from the adds in the second week. Phew. I guess we’ve all gotten some better gear and some more experience in the fight under our belts, and that all makes a difference. Apart from the difference in effectiveness between some of these spells from one week to the next, the real thing I’ve leaarnt (and relearnt) here is how much of how you heal is completely under your own radar. If you’d asked me how I healed the second week I would have naively said “the same as last week”. In fact, that was my whole rationale for choosing these two fights. The difference in the Chimaeron logs between the two weeks I laughed off as a difference in tanks: the difference was an outlier, a once-off. But maybe a shift in talents and spell effectiveness has a bigger differnece in how I actually play then I had ever realised. It’s hard to be self-aware when you’re still learning fights, so much of your spare ‘concentration GCDs’ are spent staying alive. Time for me to step back a little this week and use some of those spare GCDs to look a bit closer at how I’m healing, not just who and when. 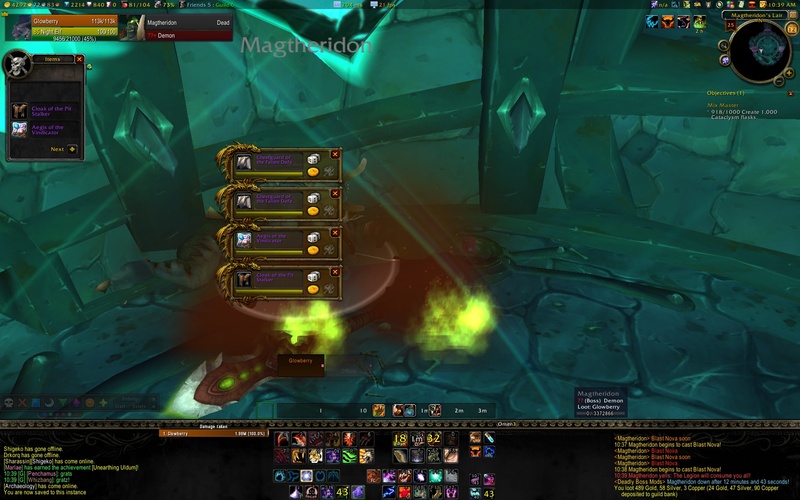 I knew some amazing death knights had soloed Magtheridon at 80, and we’d 3-manned him at 80 – so I was keen to go and see how tough he was for a level 85 character. Vermin! Leeches! Take my blood and choke on it! I’d read that his channelers were the hard part of the fight. Five of them, and they cross heal. The damage of five channelers + their summons + Magtheridon beating on me is too much to survive. SO the aim is to kill them, and then Mag. 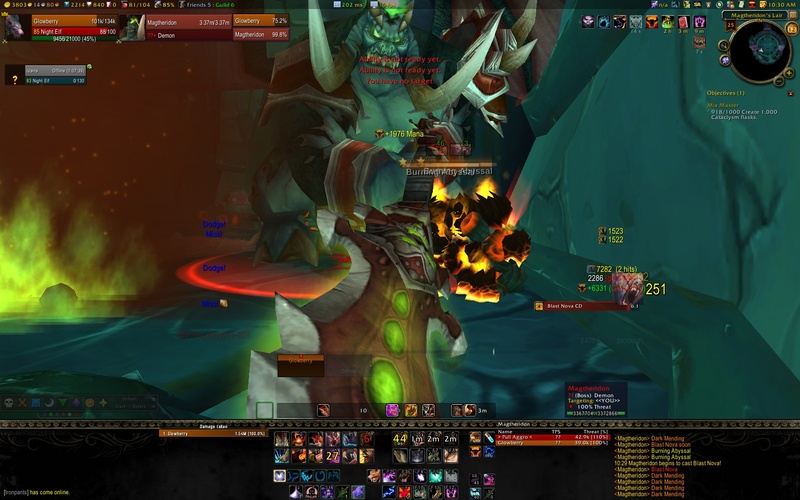 Spec: http://www.wowhead.com/talent#0ZfMGfRubzRckMcz – Kind of a munted feral build, aiming to make sure I had King of the jungle plus tanking talents. Gear: most of my feral gear is gemmed/chanted for tanking, but I have a few duplicate slots where I have a dps piece. So mainly I was wearing tank-ish pieces, which wouldn’t be my preference. If you can wear all-out dps gear, that would be optimal. Consumables: Flask of the Winds and Potions of Tol’vir. I should have brought some dps food as well. I prepotted on the pull so that I could use two potions. I tried this with multiple different strategies before I was successful, so I’ll outline the way that worked. It’s still a bit luck-of-the-draw, depending on how the channelers decide to cross heal. I started the pull in cat form, standing on a channeler, popping a potion of Tol’vir, then Tiger’s Fury, then engaging. My aim was to get max dps bleeds up before switching to bear form as the other channelers arrived. I knew I wouldn’t kill the first add, but I wanted to have DoTs ticking on it. Once the others rocked up, I switched to bear form, enraged, popped berserk and my trinkets. Then I mangle spammed with one finger hovering over the Skull bash key to interrupt the heal of my target. I threw in a Maul when I had enough rage. If I killed two channelers before Berserk was over, then I knew it was game on. Any less than that, it was game over – I’d Shadowmeld to reset it then wait for all of my cooldowns to come up, then start over. So after killing two channelers, I was good to continue; the aim is to survive until berserk comes up again. Magtheridon becomes active at some point before that, so I just popped mitigation cooldowns as needed, waiting on berserk while tanking Mag, the three remaining channelers, and all of the Abyssals. I timed going Berserk just after Magtheridon finished on of his spates of throwing me around the room. I made sure I had a channeler targeted, chugged another Tol’vir potion, popped trinkets, and mangle spammed again. This time with only three up, the cross healing is much less, so I killed all three, then onto Matheridon. Finishing off the channelers. Aka: Magtheridon's sword in my face. Once the channelers and the abyssals are dead, it’s just tank and spank till Magtheridon dies. He collapses the ceiling at 30% health, but that’s not a significant dent on a lvl 85 health pool. I shifted into cat to maximise dps, shifting back to bear as needed to self heal. So after a few days of going back in and trying with different setups, I finally killed him solo and got to enjoy the spoils: random tier 4 chests, 490g and a huge demon head on a stick. One large dead pitlord. Hoo-ray!